The AWS Management Console provides a management page for each of your AWS Elastic Beanstalk environments. From this page, you can manage your environment's configuration and perform common actions including restarting the web servers running in your environment, cloning the environment, or rebuilding it from scratch. 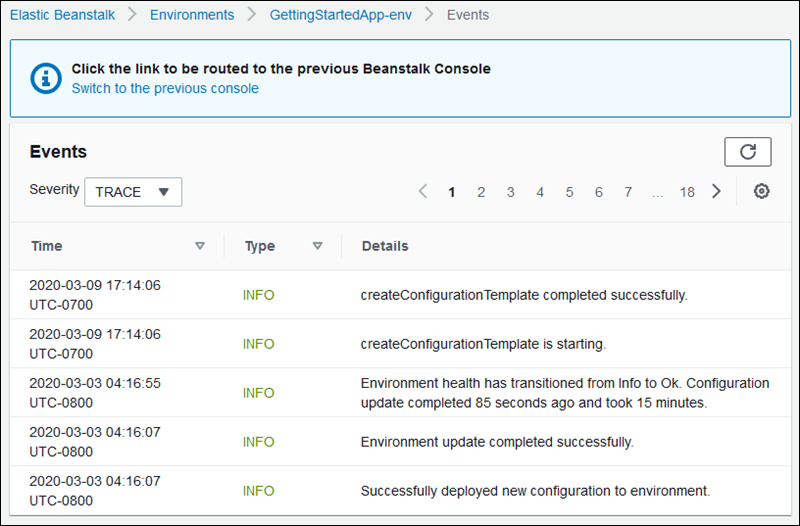 To access the environment management console, open the Elastic Beanstalk console in your region and click the name of a running environment. Environments are shown in color-coded tiles under their associated application. The color (green, gray, or red) indicates the health of the environment. At the top of the environment console, the name of the application is shown, followed by the name of the environment and the public DNS name of the running application. The main view of the environment management console is the dashboard. To view it, choose Dashboard on the navigation pane. Within the environment management dashboard is an overview, which shows the environment's health, the application version, and information about the in-use platform, and a list of recent events generated by the environment. Choose Refresh to update the information shown. The overview contains the following information and options. The overall health of the environment. With Enhanced Health Reporting and Monitoring enabled, the environment status is shown with a Causes button you can choose to view more information about the current status. For Basic Health Reporting environments, a link to the Monitoring Console is shown. The name of the application version running on your environment. Choose Upload and Deploy to upload a source bundle and deploy it to your environment. This option creates a new application version. Shows the architecture, operating system (OS) version, and platform running on your environment. Choose Change to select a different configuration. This option is available only if another compatible version of the platform is available. To be considered compatible, the architecture, OS name, and platform name must be the same. Updating the platform version using this option replaces instances running in your environment with new instances. When you first use Elastic Beanstalk, only the latest version of each platform is available for use. Change first becomes available when a new version of the OS or platform is released. After upgrading, you have the option to change back to the previous version. The Recent Events section of the environment management dashboard shows the most recent events emitted by your environment. This list is updated in real time when your environment is being updated. Choose Show All to open the Events page. The environment management console contains an Actions menu that you can use to perform common operations on your environment. This menu is shown on the right side of the environment header under the Create New Environment option. Some actions are only available under certain conditions, and will be disabled unless these conditions are met. Load a previously saved configuration. Configurations are saved to your application and can be loaded by any associated environment. If you've made changes to your environment's configuration, you can load a saved configuration to undo those changes. You can also load a configuration that you saved from a different environment running the same application to propagate configuration changes between them. Save the current configuration of your environment to your application. Before you make changes to your environment's configuration, save the current configuration so that you can roll back later, if needed. You can also apply a saved configuration when you launch a new environment. Swap the CNAME of the current environment with a new environment. After a CNAME swap, all traffic to the application using the environment URL goes to the new environment. When you are ready to deploy a new version of your application, you can launch a separate environment under the new version. When the new environment is ready to start taking requests, perform a CNAME swap to start routing traffic to the new environment with no interruption of service. For more information, see Blue/Green Deployments with Elastic Beanstalk. Launch a new environment with the same configuration as your currently running environment. Clone your current environment with the latest version of the in-use application platform. This option is available only when a newer version of the current environment's platform is available for use. Stop an in-progress environment update. Aborting an operation can cause some of the instances in your environment to be in a different state than others, depending on how far the operation progressed. This option is available only when your environment is being updated. Restart the web server running on your environment's instances. This option does not terminate or restart any AWS resources. If your environment is acting strangely in response to some bad requests, restarting the application server can restore functionality temporarily while you troubleshoot the root cause. Terminate all resources in the running environment and build a new environment with the same settings. This operation takes several minutes, equivalent to deploying a new environment from scratch. Any Amazon RDS instances running in your environment's data tier are deleted during a rebuild. If you need the data, create a snapshot. You can create a snapshot manually in the RDS console or configure your data tier's Deletion Policy to create a snapshot automatically before deleting the instance (this is the default setting when you create a data tier). Terminate all resources in the running environment, and remove the environment from the application. If you have an RDS instance running in a data tier and need to retain the data, be sure to take a snapshot before terminating your environment. You can create a snapshot manually in the RDS console or configure your data tier's Deletion Policy to create a snapshot automatically before deleting the instance (this is the default setting when you create a data tier). If the environment has been terminated in the last hour, you can restore it from this page. After an hour, you can restore it from the application overview page. The Configuration overview page shows the current configuration of your environment and its resources, including Amazon EC2 instances, load balancer, notifications, and health monitoring settings. Use the settings on this page to customize the behavior of your environment during deployments, enable additional features, and modify the instance type and other settings that you chose during environment creation. For more information, see AWS Elastic Beanstalk Environment Configuration. The Logs page lets you retrieve logs from the EC2 instances in your environment. When you request logs, Elastic Beanstalk sends a command to the instances, which then upload logs to your Elastic Beanstalk storage bucket in Amazon S3. When you request logs on this page, Elastic Beanstalk automatically deletes them from Amazon S3 after 15 minutes. You can also configure your environment's instances to upload logs to Amazon S3 for permanent storage after they have been rotated locally. For more information, see Viewing Logs from Amazon EC2 Instances in Your Elastic Beanstalk Environment. 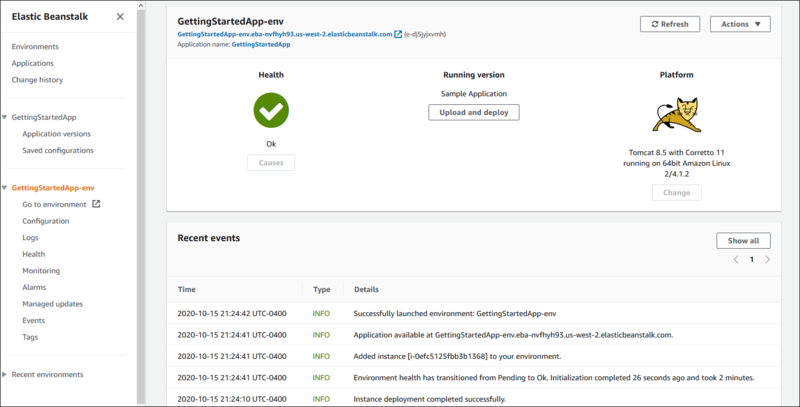 If enhanced health monitoring is enabled, the Enhanced Health Overview page shows live health information about every instance in your environment. Enhanced health monitoring enables Elastic Beanstalk to closely monitor the resources in your environment so that it can assess the health of your application more accurately. When enhanced health monitoring is enabled, this page shows information about the requests served by the instances in your environment and metrics from the operating system, including latency, load, and CPU utilization. For more information, see Enhanced Health Reporting and Monitoring. The Monitoring page shows an overview of health information for your environment. This includes the default set of metrics provided by Elastic Load Balancing and Amazon EC2, and graphs that show how the environment's health has changed over time. You can use the options on this page to configure additional graphs for resource-specific metrics, and add alarms for any metric supported by the in-use health reporting system. 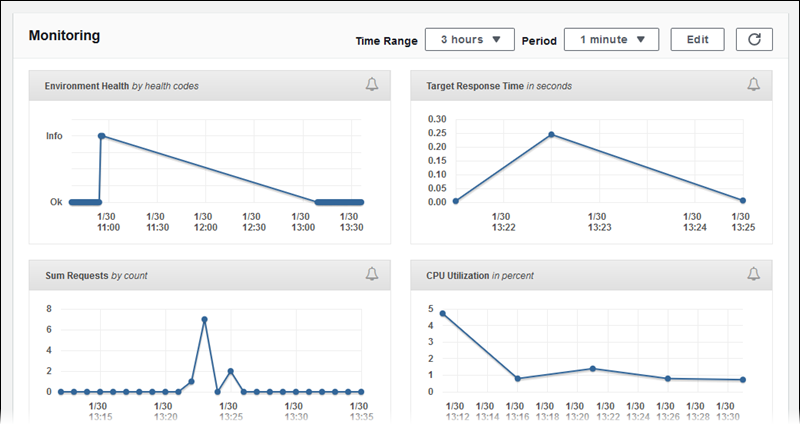 For more information, see Monitoring Environment Health in the AWS Management Console. The Existing Alarms page shows information about any alarms that you have configured for your environment. You can use the options on this page to modify or delete alarms. For more information, see Manage Alarms. The Managed Updates page shows information about upcoming and completed managed platform updates and instance replacement. These features let you configure your environment to update to the latest platform version automatically during a weekly maintenance window that you choose. In between platform releases, you can choose to have your environment replace all of its Amazon EC2 instances during the maintenance window. This can help alleviate issues that occur when your application runs for extended periods of time. The Events page shows the event stream for your environment. Elastic Beanstalk outputs event messages whenever you interact with the environment, and when any of your environment's resources are created or modified as a result. For more information, see Viewing an Elastic Beanstalk Environment's Event Stream. The Tags page shows the tags that you applied to the environment when you created it. These tags are applied to every resource that Elastic Beanstalk creates to support your application. For more information, see Tagging Resources in Your Elastic Beanstalk Environments.